The best feature of the phone, in Shareology’s opinion, is the 3G Hotspot feature. A couple of taps on the phone, and my laptop had wireless access!! Droid is serviced by Verizon; Shareology is very tired of ATT’s lack of service in large chunks of her home state. With the Droid X, Verizon works in her family’s back yard so-to-speak. If Shareology was without an internet connection, a few taps and the 3G hotspot feature on the phone would connect the laptop to the internet. This feature rocks!!! The screen was 4.3 inches measured diagonal corner to diagonal corner. But if you want to improve the readability, simple turn the phone 90 degrees, from vertical to horizontal: even better. The maps function (run by Google, are you surprised? Remember the Droid X means we’re drinking the Google water…) was a delight. Especially when Shareology got lost in St. Paul, kinda knew in general where she was, but did not have a clue how to find the road back to the west side of the river. She turned on the Droid and there was an exact map of where she was!!! Yahoo!! A couple of blocks and she was on the freeway headed home. Shareology was dragged kicking and screaming into the 21st century two years ago, when she got her first cell phone. Shareology sees no reason to become one of THOSE people….you know the ones walking around talking to themselves. Until you realize, they are actually on their cell phones. Now that she has had a smart phone for a few days, she realizes she is only a Tap Tap away from a lot of cool apps. It took a bit of practice to use the keyboard; the keys are smaller than Shareology would have liked. The backspace key came in handy the first few days until she trained her fingers to be very precise. The Walkman gives me a message of Fully Charged when it is…..yep, fully charged. With the Droid, I was forced to unplug it, plug it back it and wait for it to tell me it was at Charged 100%. The Twitter app that comes with the Droid X is not feature rich. I could not click and find the @KayLoire messages. More wired minds tell me that downloading an app like Twidroyd is a much better solution. For me, it shut off periodically. Not good if you were in the middle of something crucial. However, a few taps on the phone and my laptop, and I was connected again. You know how to fix your computer, your first step is to turn it off, and then turn it back on? The first step to fix your cell phone is to pull the battery out, pause, and put the battery back in again. Same result: sometimes this works by making the device forget its previous bad behavior. This technique stolen from a geek who fixed my Droid the one time it froze up. The Droid X is a lot lighter to carry around than my laptop. However, the laptop is much preferable for accessing full capabilities of email and twitter. Will Shareology get a Droid in October? It’s darn possible!! Shareology is getting very tired of not being able to check email and twitter on the road. As a person that’s never owned a Smartphone, the experience of using the DROID X was interesting on many levels. To start off with, it seems like the “Kings of Technology” should come up with a new term for devices that are currently called Smartphones. A phone seems to be the least used, at least for me, function on this device. There are so many tools, (oops, I meant apps. Still new to the terminology) available to use that it’s easy to forget that it’s a phone. 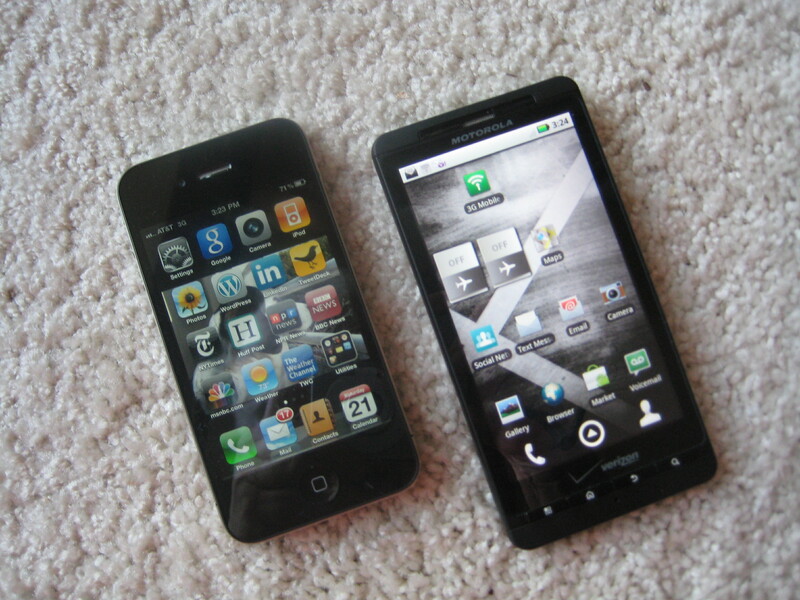 The first thing you have to notice about the Motorola DROID X is that it’s BIG. The screens size is 4.3″, so it’s going to provide you with a good sized viewing area for a Smartphone. If this device was any larger, it would probably have to a mini-tablet device. Scrolling up and down through the Application Tray screen was not difficult. I also enjoyed rotating the phone from a vertical position to a horizontal position in order to see mobile newspapers and websites in a wider view. Being able to zoom in and out by touching the screen or spreading out your fingers made small print become easier to read. As a newbie to Smartphones, I appreciated the thought in having the opening screen have a lock/unlock function on it. It would be very easy to have a Smartphone in a pocket or a purse, and have keys, a pen or some other item accidentally activate the phone without your knowledge of it. By simply placing your finger on the unlock button on the screen, and then sliding it to the right, the screen becomes active and usable to the user. After a set period of time of zero activity on the touchscreen, the screen activates the locked mode. To turn on the Smartphone, there is a physical Power/Lock key on the top of the device. This could take some getting used to. Learning how much to tap or how long to press the key took some time getting used to. In addition to the Power/Lock Key, there’s also a row of physical keys at the bottom of the touchscreen that can be used. There is a Menu Key, Home Key, Back Key and Search Key. Each do exactly what you’d think they would do by their name. It was nice to have a few physical keys to use along with the touchscreen. Once you’ve turned the DROID X on and it’s gone through it’s activation process, users are brought to a Home Screen which has a total of 7 separate panels to choose from. These panels can all be customized to work the way that you’d prefer them to function. You can move around the various widgets that they have pre-installed for your convenience and use. As mentioned earlier, there is an Application Tray (or App Tray if that’s easier to understand) that is already preloaded with apps such as Google Maps, Google Talk, YouTube, Gallery, Skype Mobile and Visual Voicemail. You can also download a variety of FREE and inexpensive apps to add to the usability of your Smartphone device. The DROID X also has a very good camera that can take stills or video. If you are new to Smartphones, having 8MP camera is just plain awesome. It takes very sharp and clear photos and videos. There is also an “effects” feature so that lets you take B&W photos and photos with other image effects. There’ss a RED shutter button on the side of the DROID X that lets you feel as if you’re using a real camera as opposed to a Smartphone that has a camera. When using the android versions of Twitter or Foursquare, the touchscreen keyboard took some getting used to, especially for a person with larger fingers, but it doesn’t take very long to adapt to it. It also has an auto-fill function that after typing a few keys, guesses what word you might be trying to use and provides you with some suggestion buttons to press instead of typing out the entire word. As a Smartphone newbie, I found that to be a helpful function. Another function I want to mention is the Google Maps. When using the map function normally, the cell towers were around 5-6 blocks within the area of my exact location. If though you turn on the satellite function from one of the Home Screen panels, your map with GPS will find you within yards if not within feet of your exact location. It was pretty amazing to see that kind of accuracy! Lastly, the telephone. I first want to say that the keypad area for dialing on the touchscreen was just great! The numbers are large and so you’d really have to be trying make a mistake in order to not hit the correct numbers that you’re dialing. I had a good connection when making calls, and the speakerphone function worked well too! 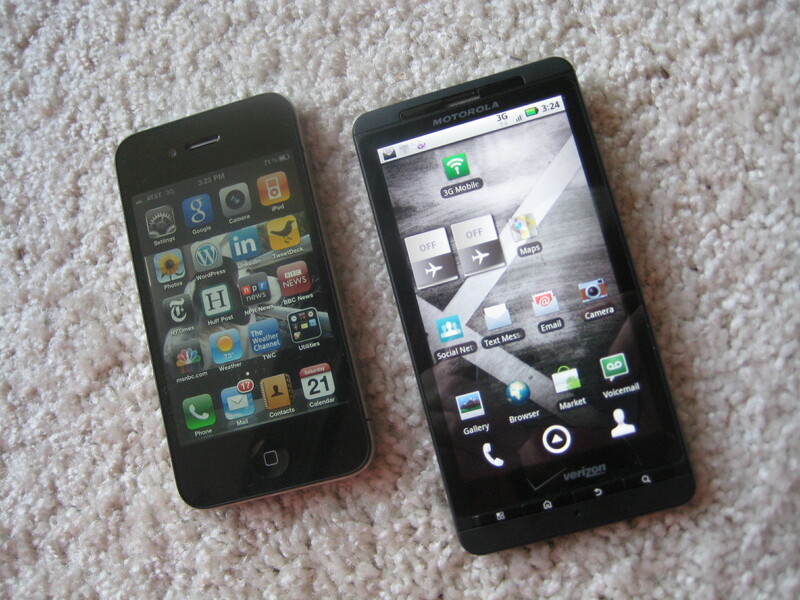 Overall, I definitely would recommend the DROID X to people looking for their first Smartphone to use. It has a wonderfully large display. It has a powerful and useful camera and it’s GPS functions are marvelous!